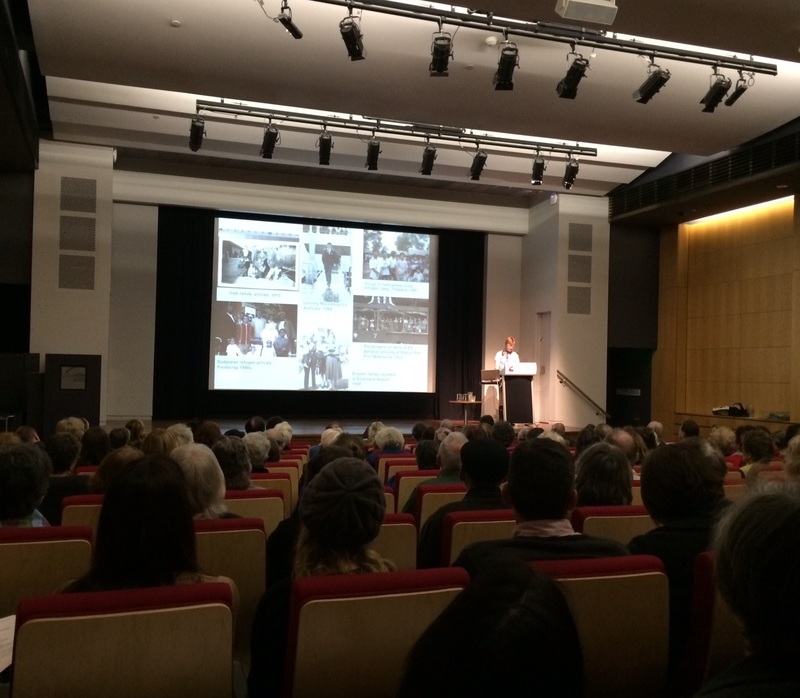 Kicking the ball off rolling in this year’s Family History Feast was Dr Moya McFadzean’s (Museum Victoria) presentation ‘More than suitcases: collecting migrant stories at Museum Victoria’ and what a great presentation to start with. In 1990 the Museum’s migration collection began. Following on from this the Immigration Museum was established in 1998. The collection covers the early years of migration to the contemporary day. One constant, says Moya are our family narratives. And while archives can help you trace documents, the Museum can show us objects and the personal stories surrounding them. Museum Victoria has a fantastic collection of objects, such as suitcases/luggage, photographs, passports, shipping ephemera, baggage labels, diaries and much more. However, objects can only speak through the people who owned them. It is the personal stories surrounding these objects which are important. An example of this can be seen in a red vinyl suitcase in their collection. This suitcase belonged to Cuc Lam, a Vietnamese refugee who sold her wedding ring in order to buy the case. She brought it with her to Australia, carrying within it the few possessions she had. She was determined not to enter Australia empty handed. The Museum have many other objects like this and where possible have collected the personal stories behind them. Many digitised items from their Migration and Cultural Diversity Collection are available to search on their website. Once again, a great start to this year’s Family History Feast! Stay tuned over the next week, as I blog about the other excellent presentations.